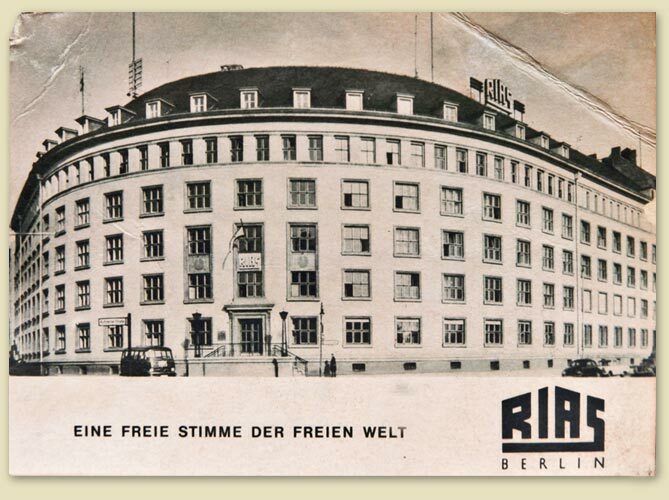 RIAS Berlin (Radio In the American Sector) was set up by the American military administration in 1946 as an independent counter-voice to the Sovietcontrolled Berlin Radio. As “the free voice of the free world”, RIAS was intended as a broadcasting bridge to the West for GDR citizens. The supervision of RIAS Berlin broadcasting and programming was in the hands of the United States Information Service. The exclusively German employees were paid by the US authorities and were subject to American labour laws. The victors initially distrusted the vanquished altogether. German journalists initially worked under the close surveillance of American supervising officers, and the texts of all newscasts had to be vetted prior to transmission. Among those supervising officers was Harry Frommermann, one of the founders of the famous “Comedian Harmonists” that had been all the rage in the 1930s. Frommermann was a Jew who had emigrated to the USA in time and returned home after the war as an American officer. A lot of music was included in the RIAS programme: classical and light, and especially jazz and swing, which had been prohibited in the Nazi period. 1947 saw the formation of the RIAS Symphony Orchestra, Chamber Orchestra and Chamber Choir; the RIAS Dance Orchestra would follow. RIAS always understood itself as a news service committed to the truth and never as a propaganda station. Many prominent German journalists learnt their craft with RIAS, including Jürgen Graf, Peter Schulze, Egon Bahr (now a prominent German elder statesman), Klaus Harprecht, Claus Bölling, Richard Löwenthal and Friedrich Luft. RIAS was naturally always a thorn in the side of those in power in East Berlin. Listening to RIAS was sometimes severely punished in the GDR and the propaganda included sayings like: “Ducks have short legs, RIAS has particularly small ones“, “RIAS lies truth wins“, “If your neighbours tune in to RIAS, tell them in no uncertain terms to stop”, “RIAS begins with music and then agitates for war” and “Poison from RIAS’ mouth has been the downfall of many a poor devil.” Small but effective stations were set up throughout the GDR to jam RIAS transmissions.